Take your homebrewing to the next level with this convenient kegerator conversion kit for Cornelius kegs. Bottling your homebrew beer is fine, but nothing compares to serving it fresh from a tap. If you’re ready to make the leap, this homebrew kegerator conversion kit is exactly what you need. Designed specifically for a Cornelius keg (not included), this kit provides everything you need to transform an old refrigerator into a beer dispensing system. You’ll get the large equipment – CO2 tank, CO2 regulator, faucet head and knob, etc. – as well as all the small connectors, washers, and accessories. Plus, the ball-style disconnects make it incredible easy to attach your homebrew tanks. You don’t have to be a handyman extraordinaire to install your conversion kit. Our detailed instructions will show you how to set up all the equipment and mount the faucet on the front of the fridge door. Please note: this system will not tap commercial kegs. The kit makes this so easy to install into your fridge. 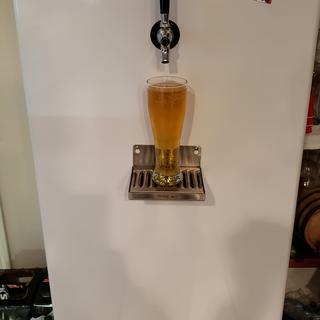 I bought this particular fridge to be a dedicated beverage box, at the time I hadn't even considered a kegerator conversion but have been making my own home brew for sometime and bottling it. No more fighting with the capper, fill up a keg and done. Only thing you need to buy extra is a 7/8" hole saw to mount the tap. 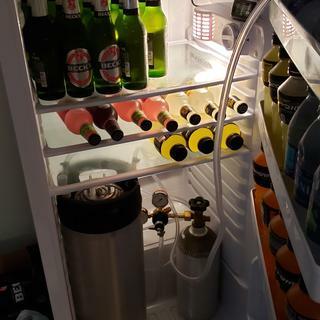 I am taking the leap to kegging and making a kegerator out of my mini fridge! !